The all-new 2016 Honda Pilot SUV made its global premiere today at the 2015 Chicago Auto Show. 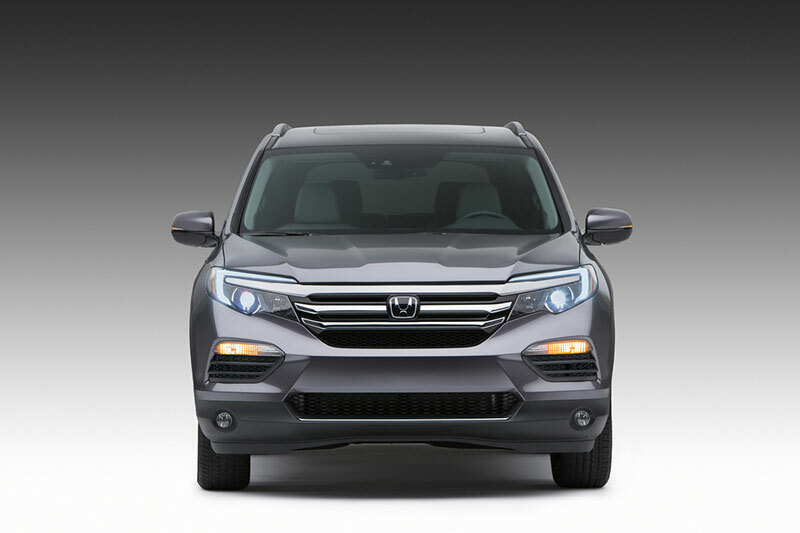 Reengineered and redesigned in America, the 2016 Honda Pilot delivers more family-friendly utility, more advance technology and more premium attributes and amenities than ever before, boasting class-leading safety features, fuel efficiency and confident driving dynamics in a thoroughly modern, stylish and sophisticated new package. 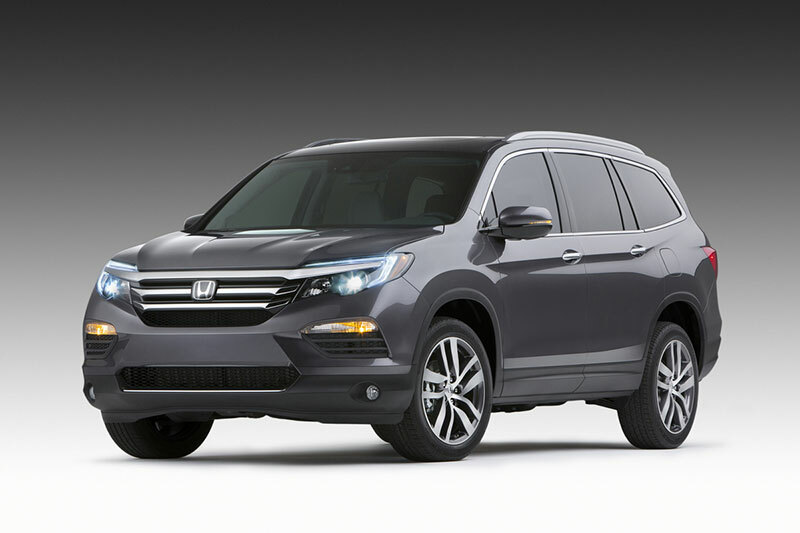 The all-new 2016 Pilot, launching at Honda dealerships nationwide this summer, is the third generation of Honda’s three-row midsize SUV to be designed, developed and manufactured in America. Reinforcing 2015 as the “Year of Honda,” Pilot further strengthens Honda’s SUV/CUV triple threat by joining the exceptionally well received 2015 CR-V (2015 Motor TrendSUV of the Year) and greatly anticipated new 2016 HR-V. The all-new design of the 2016 Pilot sports a modern, sleek, yet commanding and muscular form incorporating new premium features, including optional brighter and more efficient LED projector headlights with auto high beam technology, available signature LED daytime running lights and taillights, plus available 20-inch wheels and a first-ever panoramic roof option. The premium quality of the new Pilot carries over to the interior, where designers have applied high-quality, soft- touch materials throughout the cabin and added thoughtful details such as LED map lighting. Additional high-end amenities include available heated and ventilated front seats, a heated steering wheel and heated second-row seats. For the first time, upper-trim Pilot models will have available two second-row captain’s chairs, providing for easy walk through between the second and third rows, in addition to the standard second-row three-person 60/40 split seat for 8-passenger seating capacity. The new Pilot delivers the connectivity and power access that the modern family demands, including up to five USB ports, four that provide better recharging with 2.5-amp output, to charge iPads or smartphones while in use. Additional ports and plugs include an auxiliary jack for nearly any audio player, an HDMI port for a gaming console, two headphone jacks, two 12-volt power outlets and a 115-volt outlet to power just about anything. The new Pilot also incorporates Honda’s latest thinking for advanced, family-friendly technology, including an upsized 8-inch capacitive touchscreen Display Audio telematics interface powered by a new Android-based operating system and more powerful processor, along with an available all-new embedded Honda Satellite-Linked Navigation System™. The new navigation system features improved graphics and new capabilities, including 3D renderings of terrain, buildings and road signs, improved lane guidance, live search function, 911 emergency services and more. The Pilot’s Display Audio system enables simplified smartphone connectivity making for easier access to all the features and connectivity options of the HondaLink™ connected-car system. A 9-inch rear entertainment system with DVD and new Blu-Ray disc™ capability is available. The new Pilot builds on its reputation for best-in-class interior space, versatility and utility with 3.5 inches of added overall vehicle length, enabling a larger cargo area that can hold an 82-quart cooler without compromising third-row seating capability, a segment-exclusive feature. Third-row entry and exit is made even easier and more intuitive courtesy of an available one-touch walk-in second-row seat that slides and tilts to its forward-most position at the touch of a button. As compared with the current Pilot, the width of the lower portion of the third-row entryway has been increased by 2.5 inches with 1-inch lower step-over height. The Pilot’s new center console features a cavernous storage compartment capable of accommodating items as large as a full-size iPad or large purse. And with its seamless cover in the closed position, the console provides a convenient, non-slip surface for items that the driver or front passenger may need close at hand. The 2016 Pilot delivers more refined, powerful and fuel-efficient performance than ever before courtesy of its new 3.5-liter, direct-injected i-VTEC® V-6 engine with Variable Cylinder Management™ (VCM™) cylinder deactivation technology. For improved fuel efficiency, the Pilot will include available Idle Stop technology that shuts off the engine when the vehicle is stopped, instantly and smoothly restarting the engine when the driver lifts their foot off the brake pedal. The new engine is mated to one of two advanced new transmissions – a Pilot-first 6-speed automatic transmission, or on upper trims, a Honda-first 9-speed automatic transmission – both delivering notably refined, responsive and fuel-efficient performance. The new Pilot will be available in front-wheel and all-wheel-drive configurations and will feature a completely new Honda all-wheel-drive system that delivers even more confident, efficient and dynamic all-weather performance. The new Pilot is almost 300 pounds lighter than the outgoing model; its more rigid, tightly sealed yet lighter body in combination with new, efficient powertrains, a new all-wheel-drive system and class-leading aerodynamics result in class-leading dynamic performance and fuel efficiency along with a new level of cabin quietness befitting its status as a premium family SUV. In keeping with Honda’s commitment to safety, the new Pilot will feature the most comprehensive set of advanced safety and driver-assistive technologies ever offered on a Honda vehicle. Together these technologies make up Honda Sensing™, a suite of technologies designed to expand the driver’s situational awareness while sensing and responding to potential road hazards, including other vehicles, road obstacles and even pedestrians, mitigating the possibility or severity of a collision. It includes Honda’s popular LaneWatch™ display, Blind Spot Indicators, a standard Multi-Angle Rear View Camera, and available Collision Mitigation Braking System™ (CMBS), Lane Departure Warning (LDW), Forward Collision Warning (FCW), Lane Keeping Assist System (LKAS), Rear Cross Traffic Monitor, Adaptive Cruise Control and a Honda-first Road Departure Mitigation (RDM) system. The new Pilot is expected to deliver the highest safety ratings in its class and targets a 5-Star Overall Vehicle Score from the National Highway and Traffic Safety Administration (NHTSA) and a TOP SAFETY PICK+ rating from the Insurance Institute for Highway Safety (IIHS), including a GOOD rating in all crash modes. The new Pilot incorporates Honda’s next-generation Advanced Compatibility Engineering™ (ACE™) body structure, designed to more efficiently absorb and disperse the energy from a frontal collision, along with a new ultra-high-strength door ring designed to help better protect occupants. The 2016 Pilot also incorporates an all-new 3-bone platform while also utilizing high and ultra-high strength body materials, which together reduce noise, vibration and harness (NVH), improve handling, increase rigidity and reduce weight. Standard safety and driver-assistive features include four-channel anti-lock brakes (ABS) with Brake Assist and Hill Start Assist; Vehicle Stability Assist™ (VSA®) with Traction Control; an Expanded View Driver’s Mirror; dual-stage, multiple-threshold front airbags, driver and front passenger SmartVent™ side airbags and side-curtain airbags for all outboard seating positions; and a new Tire Pressure Monitoring System (TPMS) with real-time display of individual tire pressures. 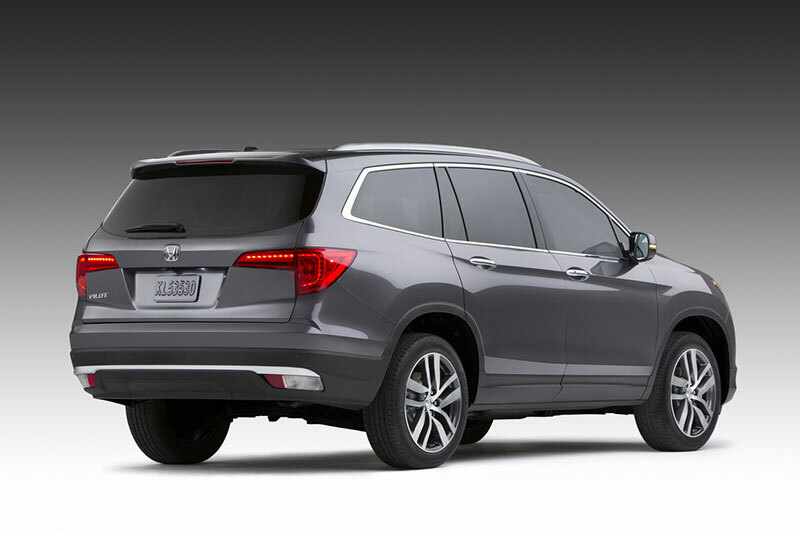 All three generations of the Honda Pilot have been designed and developed in America by Honda R&D Americas, Inc. at its Los Angeles design studio and Raymond, Ohio, vehicle development center. The Pilot and its engine are manufactured at Honda’s Lincoln, Alabama auto plant. In 2014, nearly 98 percent of all Honda-brand vehicles were produced in North America. The Pilot joins the Honda CR-V – 2015 Motor Trend SUV of the Year and America’s best-selling SUV for eight of the past 11 years – the popular Odyssey minivan and the dynamic new HR-V crossover, launching this spring, in Honda’s growing lineup of innovative light truck offerings. An all-new Honda Ridgeline pickup will join the Honda lineup within the next two years. All Honda light truck models are produced in North America using domestic and globally sourced parts.